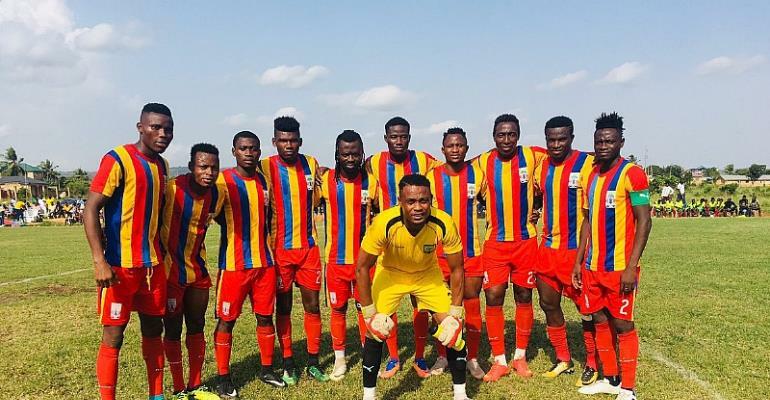 Free scoring Accra Hearts of Oak put up a five-star performance yesterday to beat Division 2 side Tama Wonders by six goals to nothing at the Pobiman Park. The Phobians who have been engaged in a number of friendly matches in the absence of a competitive league continued their winning ways in what might be their last friendly game ahead of the start of the Normalization Committee Special Competition which is expected to start next weekend. Despite being a friendly match, head coach Kim Grant fielded a strong side anchored around danger man Joseph Esso to ensure the team recorded another victory on the day. In a match dominated by the Accra based side, the away team had little chance of finding the back of the net as they were mercilessly whipped by the Ghana Premier League giants. Hearts scored three goals in each half with Joseph Esso, Kojo Bonney and Michelle Sarpong getting the first set of goals. After the break, Kofi Kordzi, Anthony Quayson and Abubakari Traore also scored to complete a resounding victory. This is the 19th friendly match played under Kim Grant. The team has impressively won 15 of them, drawn 3 and lost just 1. They look the real deal going into the NC competition which could potentially give them an opportunity to play in Africa next season. If the competition does start next weekend, Hearts of Oak will play their first match against Dreams fc at the Accra Sports Stadium.